코미디 시리즈 ‘몬티파이튼’ 출신의 유명 배우이자 여행가인 팰린은 2년여에 걸친 북한 정부와 협상 끝에 2018년 5월 촬영팀을 이끌고 북한을 방문했다. 약 2주 동안 북한에 머물며 취재한 내용을 바탕으로 만들어진 여행 다큐멘터리 2부작 ‘북한에서 마이클 팰린(Michael Palin in North Korea)’ 1편이 9월에 영국 지상파 방송국 채널5에서 방송되었다. 통제사회 북한의 수많은 규율을 지키려고 애쓰는 상황들을 재치 있으면서도 교훈적으로 담은 이 다큐는 많은 시청자들의 호평을 받았다. 미국 판권은 경쟁사를 제치고 내셔널 지오그래픽 (National Geographic)이 따냈다. 오는 일요일 방송한다. Amid glimpses of possible progress in U.S.-North Korea relations, National Geographic has picked up U.S. rights to Monty Python star Michael Palin’s documentary special shot inside the secretive Asian country. 다큐 살짝 엿보기! 안내원의 한국어 강의, 안녕하십니까? 그는 첫날 호텔로 향하면서 비록 제약이 있지만 이번 평양 방문이 악의 축으로 묘사된 북한에 대해 올바로 이해할 수 있는 기회가 되기를 바란다고 말한다. 중국 단둥에서 열차를 타고 수도 평양에 도착한 마이클은 그의 모든 동선을 가이드할 북한 안내원을 만난다. 김일성, 김정일 동상을 방문하고, 선전예술의 창작과정을 엿보고, 학생들에게 외부세계에 대해서 알고 있는 것이 무엇인지 묻는다. 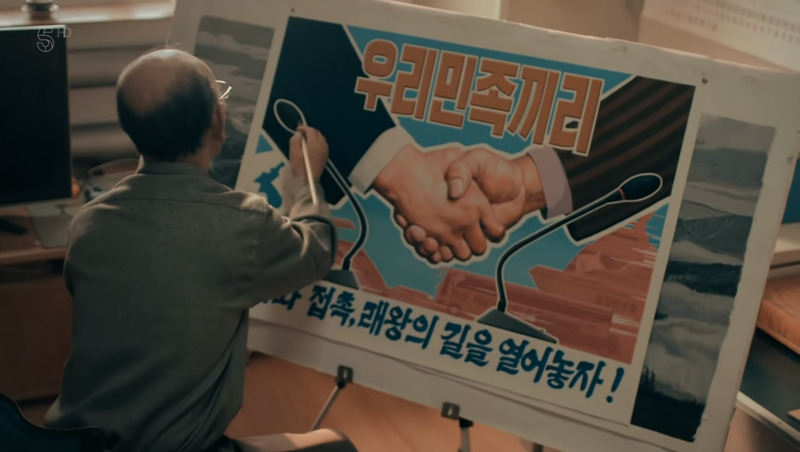 Michael Palin arrives in Pyongyang in the opening part of this world exclusive documentary series filmed at a critical time in North Korea’s history. There, he gets his first look at a country that has been cut off from the outside world for 70 years, and meets the guides who will follow his every move. They visit the two 22-metre-tall statues of Kim Il-Sung and Kim Jong-Il, before taking in a government-run health spa, which offers punters 12 “recommended” haircuts. Michael also witnesses propaganda art being created in front of his eyes. The next day is May Day, a national holiday and a chance to party with ordinary, dance-loving locals. 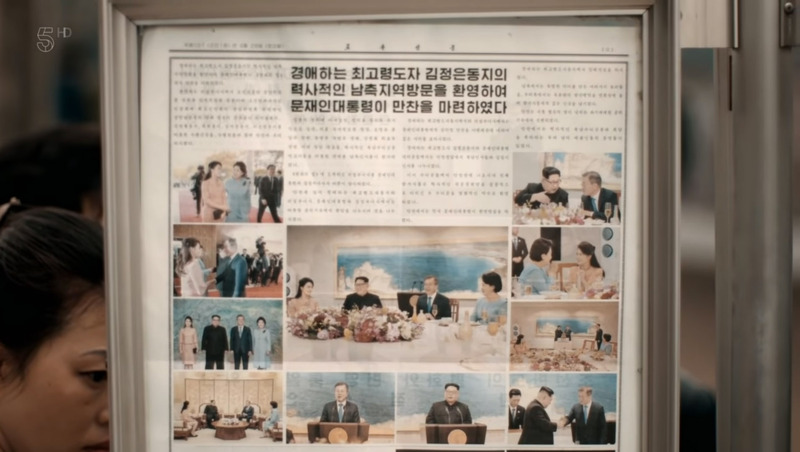 평양을 떠나 판문점 공동경비구역(JSA, Joint Security Area)에 도착한 마이클 팰린은 22년전인 1976년 남측지역에서 방문한 적이 있다고 한다. 이어 한국전쟁에서 파괴되지 않은 몇 안되는 곳 중의 하나인 개성을 방문, 전통 한옥에서 숙박을 하고 동해안 비치 리조트 원산으로 이동한다. 외곽의 밭에서 일하는 여성 농민과 북한의 식량사정에 대해 잠깐 얘기를 나누고 그녀의 집을 방문하여 김치도 맛본다. 다음 날은 금강산으로 향한다. 그기서 가이드 소향과 민감한 주제에 대해 얘기도 나누고 다시 원산으로 돌아와 백두산을 가기위해 고려항공 비행기를 타고 삼지연공항으로 향한다. 현지 안내원은 백두산이 김일성의 항일무장투쟁 근거지이며, 김정일 국방위원장이 태어난 곳이라며 생가를 안내한다. Completing his remarkable two-part North Korean travelogue, Michael Palin leaves Pyongyang via a potent symbol of the region’s delicate situation. The imposing Arch of Reunification symbolises a desire for North and South Korea to be brought together. 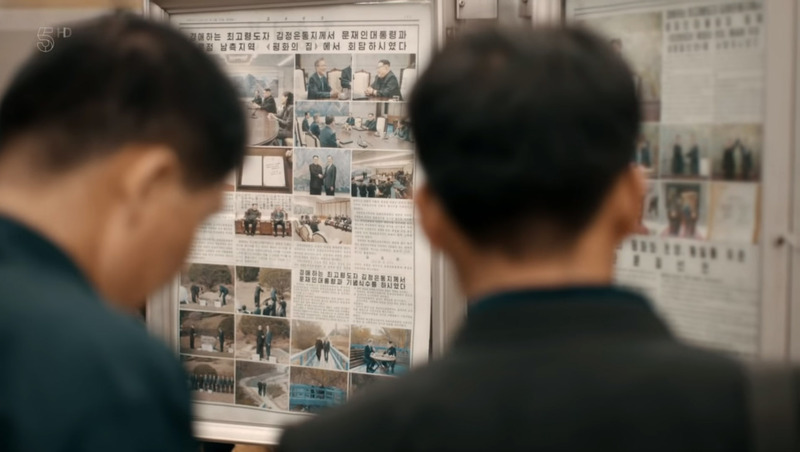 But with the two countries still on a war footing, Michael is put under the protection of armed guards as he is shown the Joint Security Area on the Border. He then visits the town of Kaesong, one of the few places not destroyed during the Korean War. Michael also takes in an ambitious tourist resort and discusses food shortages with a farmer, before returning to bid Pyongyang farewell.